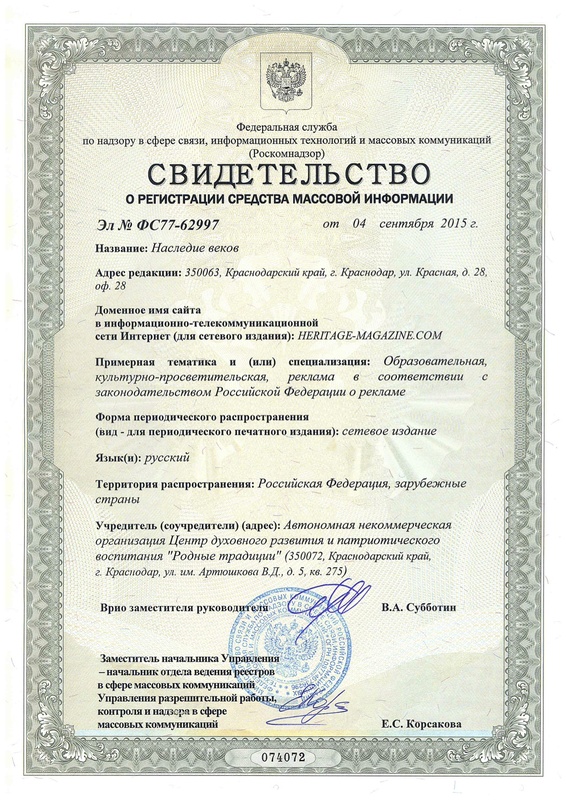 The electronic scientific journal «Heritage of Centuries» was founded in 2015. Тhe periodicity of the publication is 4 issues per year (quarterly). The journal is an ongoing online publication that does not have a printed equivalent. All articles published in the magazine are compulsorily reviewed in accordance with the approved rules. The full texts of the articles are publicly available and do not require additional registration. Any violation of copyrights is prosecuted by law. Reprinting of the journal’s materials is allowed only upon the agreement with the editorial staff. The opinions of the authors may not coincide with the editorial point of view. The journal is referenced and indexed in the RINC system, Google Scholar. Materials of the journal “Heritage of Centuries” can be used, copied, quoted for non-commercial purposes with the obligatory indication of the author’s name and source of borrowing. Operating system – MS Windows XP professional; Browsers – Internet Explorer 6.0 and higher, Opera, Firefox, Safari; Software – Acrobat Reader.